Proofreading jobs are in high demand as online content is increasing every day and are one of the best stay at home jobs for moms that you can find. Online proofreading jobs for beginners can be a bit tricky to find because most places want you to have experience, but I’ve got some ways for you to build experience to get you started proofreading from home or anywhere! Why are proofreaders in demand? Bloggers, small business owners, and entrepreneurs are motivated to use online content to build their business. There is an increasing number of opportunities to proofread and edit content from online e-books, blogs, social media posts, email content, and more! 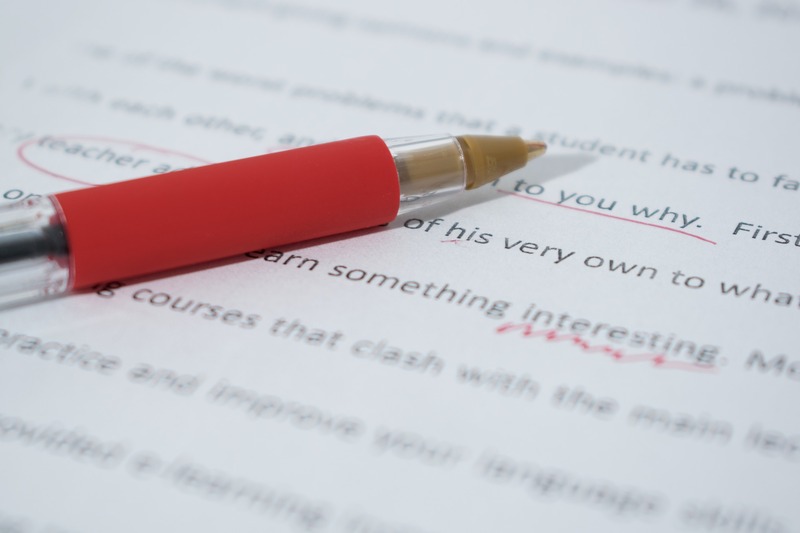 There is a difference between editing and proofreading even though the terms are commonly used interchangeably. Editing is creating an over all cohesiveness to a piece of writing. It addresses the flow, style, clarity, sentence structure and the message of a piece of writing. Proofreading is the nitty gritty of the writing piece. The proofreading process requires you to correct grammar, spelling mistakes, and punctuation. Editing is the big picture while proofreading is the mechanics of a piece of writing. This is a list of companies that hire online proofreading jobs, no experience! Each company has it’s own requirements and may require you to pass a proofreading exam before you can start work. Also, these companies sometimes hire in batches, but you can usually apply at any time. Just be prepared that it could be several weeks or months even before you hear from them. Domainite hires editing/proofreading positions from home with NO experience! Pays weekly through Paypal. Smart Brief has editing opportunities for beginners. Lionbridge has temporary jobs opportunities to edit for specific projects. Babbletype has occasional opportunities to edit translations. Indeed.com – Just type “Proofreading” or “Editor” in the “What” section and “Remote” or “Work from Home” in the “Where” section. FlexJobs.com – You can find telecommute proofreading/editing jobs on FlexJobs. You do need to join their site for $15 per month in order to access job listings. FlexJobs is very reputable and worth the membership if you are serious about finding a work from home job. They thoroughly review every job posting to be sure that it is a legit work from home opportunity. You can cancel the membership at any time! These online proofreading/editing jobs are usually accepting applications, but they may not be currently hiring. Many of these companies require some experience and that you pass an exam before getting started. Check out these work from home jobs for beginners to get started proofreading! Book in a Box – Editing for books and other gigs. Find out more about General Online Proofreading Jobs! Looking for work from home jobs can be difficult when you are a beginner! It feels a little overwhelming when you don’t know WHERE to find legit work from home jobs. FlexJobs is a great place to find legit work from home jobs in a variety of fields including beginner proofreading jobs. You pay a monthly fee (that can be canceled at any time). FlexJobs approves every works with national and international businesses to provide high quality job opportunities. They also verify job postings to ensure there are no scams. FlexJobs has many resources you can use to improve your resume, pass initial online screenings, prepare for interviews and so much more! Check out FlexJobs to see all the amazing opportunities available! If you want more control over your work, then you could start a freelance proofreading business from home. Below I have listed 2 ways you can start working from home as a freelance proofreader. Learn how to get a job proofreading books, blogs, and websites. You don’t need a college degree to get started as long as you have an eagle eye for grammar, punctuation, and spelling errors. Proofreading jobs for beginners are available as more content is needed for business emails, social media accounts, and blogs. Caitlyn Pyle of Proofread Anywhere has put together an extremely valuable FREE online workshop to help you get started with general proofreading. You can register here for the free workshop. In the workshop, Caitlyn gives you tips on where to find clients, tools for proofreading, and how to maximize your skills! She also shares about her course General Proofreading: Theory & Practice. You can literally work proofreading jobs from anywhere on your iPad as long as you have a wifi connection proofreading transcripts for court reporters. You can read more about A Day in the Life of a Transcription Proofreader here. Search Engine Evaluator jobs are similar to proofreading jobs, but you don’t need ANY experience to get started! Basically as a search engine evaluator you are evaluating or proofreading search engine results to ensure that the search query brings back logical results. User testing jobs are also similar to proofreading jobs. Companies will hire people to do independent contract work to “proofread” a website or app for the user experience. Your job as a user tester is to determine if a site or app is user friendly. You can also take this FREE 7 day e-course to learn more tips about getting started as a proofreader for court reporters. This is a specific niche with lots of job opportunity!